Skiing Mt. 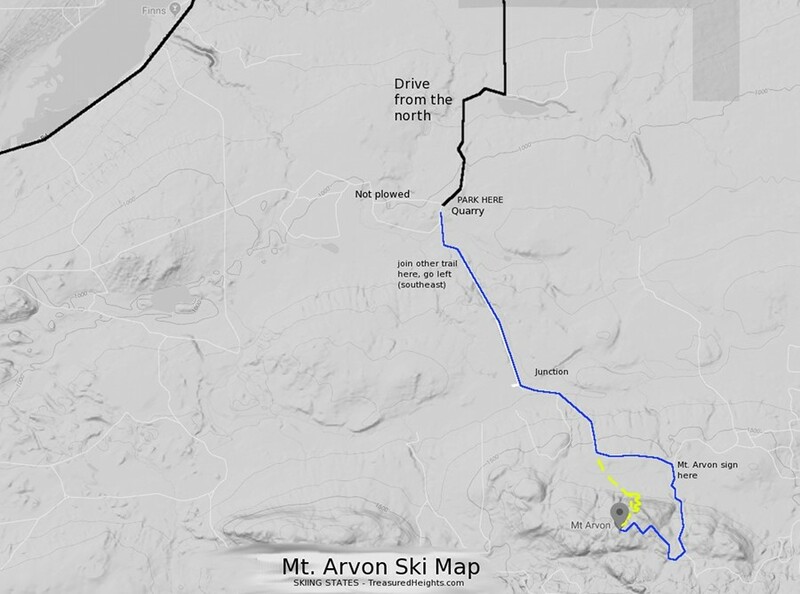 Arvon turned out to more complicated than I expected, but now with information it can be less of an adventure and more of a pleasant ski into the biggest blank space on the map in northern Michigan. Below you’ll find tips and the story of finding the way there. Most highpointers do Mt. Arvon in the summer. They follow diamond-shaped signs that guide them through the maze of logging roads and they arrive at 1979′. If you want to do the high point in winter, there is less support and you’ll need maps, but it is a nice cross-country ski on “groomed” trails. 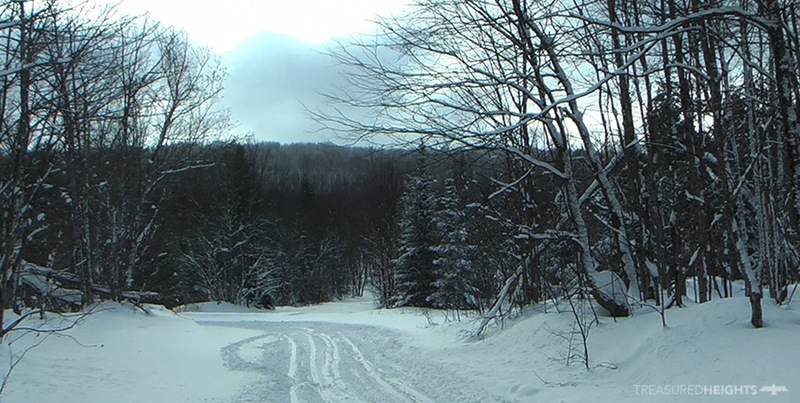 Snowmobiles flatten the trail and allow for gliding downhill if it’s not powdery. If its icy you can glide possibly half of the long journey, it can be a moderate xc ski under ideal conditions. Since the trip is 12-15 miles round trip depending on how you do it, it can be a strenuous/dangerous trip under sticky, deep or overly cold snow. By “cold” snow I mean when its so cold that ice crystals are not melting under pressure of your ski, so the crystals actually dig into your ptex and you stick. This is very noticable when your skiing low angle trails and gravity can’t overcome the friction. The main danger of the route is that if a storm strikes when your mid way out you can expect a cold, wet, long trip out. Overall I’d say Arvon is a difficult trip mainly because it is mentally taxing as there are no cliffs, rivers, lakes or other major landmarks to break up the miles. If your already fit and used to mileage it’s a nice long workout and can be fun. Their are better spots for backcountry skiing in Michigan, but Michigan’s highest point makes for good cross-country skiing. You can make a backcountry skiing day out of it if you hit the right spot however. How do you approach this peak in the wilderness of the Upper Peninsula? 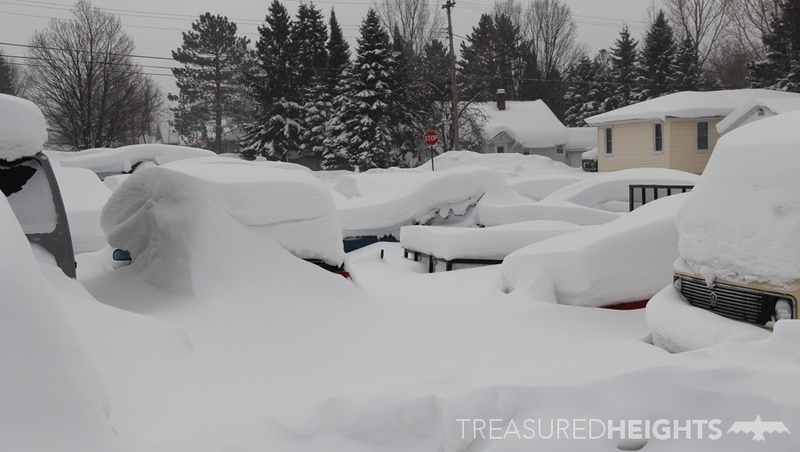 I reached the snow-blasted town of L’anse, Michigan in the afternoon. There was no beta anywhere online skiing, even for snowshoeing Mt. 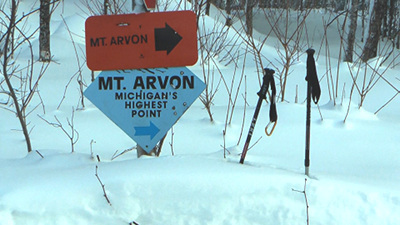 Arvon (Michigan’s highest “peak”). I asked a tourist office, all they did was talk about snowmobiles, there are tons of snowmobile trails through the region so it was obvious I would have to be skiing on them for part of this, however doing 30 miles from L’anse was not realistic under human power. I had to find another way to get closer to the peak, a closer trailhead. I had 3 maps at my disposal and decided to probe the wilderness by seeing how far I could get to the mountain using forest roads from the west – a mistake. 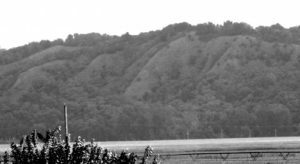 Mt Arvon is not the most dramatic of Michigan’s mountains, however it makes a nice day trip. 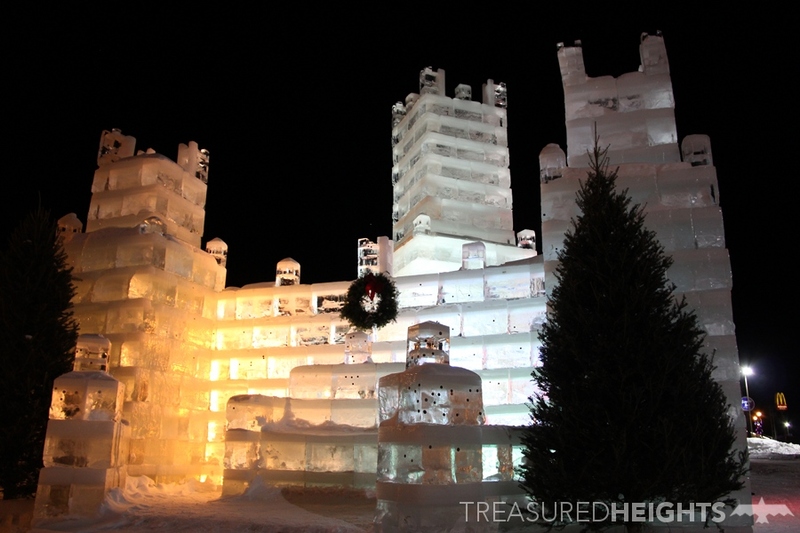 It was -7 F as I blasted down beautiful snowy roads with massive snow banks into the darkness. I got more excited as I noticed considerable miles being eaten away between me and the peak in the heart of this block of wilderness. This would shorten my journey. After 12 miles the plowing stopped and there was a fresh powdery 10” of snow on the road. Not too bad, its light and fluffy. I continued on, then on a slight uphill it stopped. Wheels spun. Game over, and still too far from the peak. It was time to suit up, whip out the heavy shovel and traction screens. It took two hours to get the car back to the plowed road due to totally bald tires on the rental vehicle (is that even legal to give someone junk tires?). I tried another side road which was well-traveled by lumber machines. Still no luck as the road was not on the maps and headed off north instead of west. The West was not the way to go. Like this for miles and miles. It would be more fun on cross-country skis instead of backcountry skis, but I wanted to ski the North slope of Arvon which would have had some deep pow turns that day. On day 2 I tried the other approach from the north. No one had published any info on skiing or snowshoeing the peak, but I had a map of the network of forest roads. My goal was to ski from the flat-topped summit and ski steeper terrain on the north slope, this would give a few hundred vertical of powder turns. No one had published any data on skiing or snowshoeing the peak which made getting there by human-powered means difficult. There was no straightforward way to get to the peak. I parked at a lonely quarry on the edge of the wild at 0F and skinned in on soft untracked snow. The miles rolled away as I gained only gradual elevation. At one point I met a few snowmobilers doing a long tour of U.P., they found it bazaar to encounter me this far in here and thought I was lost or something. They offered to give me a ride, I said no I’m fine, the peak has to be done properly, even if it means a slog. This trip was more of slog because I was using heavy AT gear. Since I was travelling to multiple states and peaks I could only bring one pair of skis with me so it had to be the fat heavy verdicts. I had a big backpack, actually a mountaineering pack because again I was travelling light and had only one pack for both overnight trips and day trips on this vacation. All together the gear was overkill. I’d love to try the peak again with carbon fiber skis and super light boots, or even better, my xc skis. For navigation I had 3 maps, all of which were inaccurate in some way. I used the Delorme InReach in combo with a phone topo app that also lacked lumber roads to keep myself on track towards the summit. It was cold enough to make snot freeze so I had puffys and gloves which could be used in an overnight if needed. Once could run this route in light skis and a small pack, however be aware if you twist an ankle/leg you may need to spend the night, so bring warm clothes, and also they can be used if high winds pick up during the long day. The blue line follows the xc ski route (my route), the yellow shows how you’d deviate for backcountry skiing the north slope (bushwhack). Beware there are more logging roads than this map shows. After the few humans I saw that day left I noticed how late it was. I began to feel the deafening silence of the wilderness. I was a warm tiny human surrounded by an immense cold wilderness. Normally when I’m on remote mountains I can always turn around and glide out, gravity’s heavenly hand carries me back to civilization. I felt isolated and alone here because there is no quick out on flat terrain. The peak was the longest flat high point approach so far. For the ultimate long flat approach see my article on skiing King’s Peak, Utah or Wyoming’s Gannett Peak. Arvon’s flat approach seemed grueling on 14lb heavy Black Diamond verdict skis with Freeride bindings. If I just had my cross-country skis this would be a breeze. 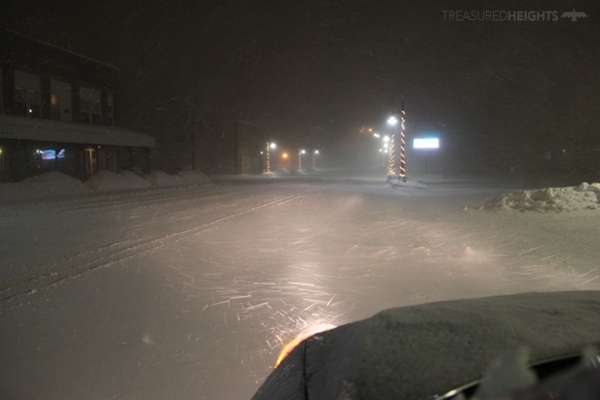 This is “Mount” Arvon, the north slope ahead would yield some powder turns similar to Timms Hill in Wisconsin. 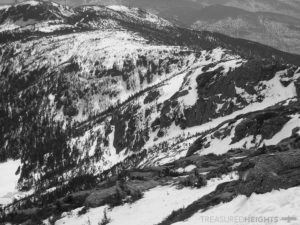 In the photo above if you are on backcountry skis and wish to tap Arvon’s steeper terrain I recommend you bushwhack straight at the mountain, not go left with the trail. Cutting straight to the mountain and navigating the woods will save you miles, even if its breaking trail, and when you return you can cut pow turns on Arvon’s north slopes, and use your skin trail to shoot back to the trails. Use kick wax on the way up if you can, because skinning in on the gradual up is irritatingly slow. You’ll only need skins for the final 300 vert where it’s steeper. If you have cross-country skis you should continue on the snowmobile trails, because you’ll be able to glide down on more gradual slopes and skinny skis are less efficient in breaking trail in the powder on the straightline option. XC skis with scales on the bottom will have a very distinct advantage here as its about 4 miles of gradual uphill and as I said before, skins are not the way to go if you can manage without them. They have signs in some places probably because the network of forest roads gets people lost. I had my eye on the north slope of Arvon which offered the most promise for some steeper turns. When I finally snaked up roads to its flat featureless summit area I realized that due to the distance and time I’d be better off gliding down packed snowmobile trails to gain distance than trying to hash out a new line in the dark. The summit area was really confusing as there are a network of logging roads up there and if you have fresh snow it’s not clear which one goes to the top. The trails wander a lot so you can’t use your compass to figure out if you got the right one. I’ve included map graphics with this article below to help you navigate the final convoluted path. It was a real bummer to run out of daylight, I’d really wanted to explore that slope. I guess someone else will have to go find out what that slope is really like, If anyone gets up there let me know how it is for backcountry skiing by contacting me on the facebook page. 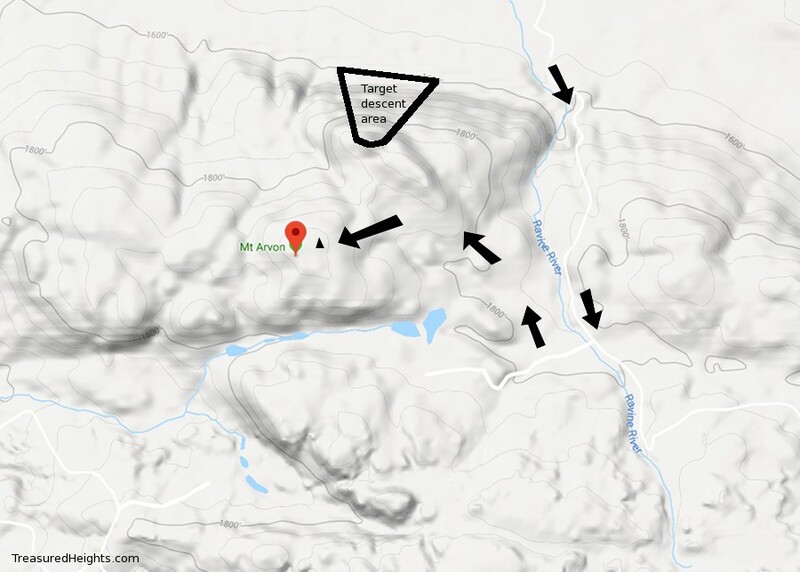 My path followed logging roads, the better option is to shoot a compass bearing straight for the Target descent area, climb the peak, and ski down the area. Satellite view of the logging roads. If you have more light to ski with you can wander around on the flat summit and find the summit sign which many people take photos of since the summit is not distinct. 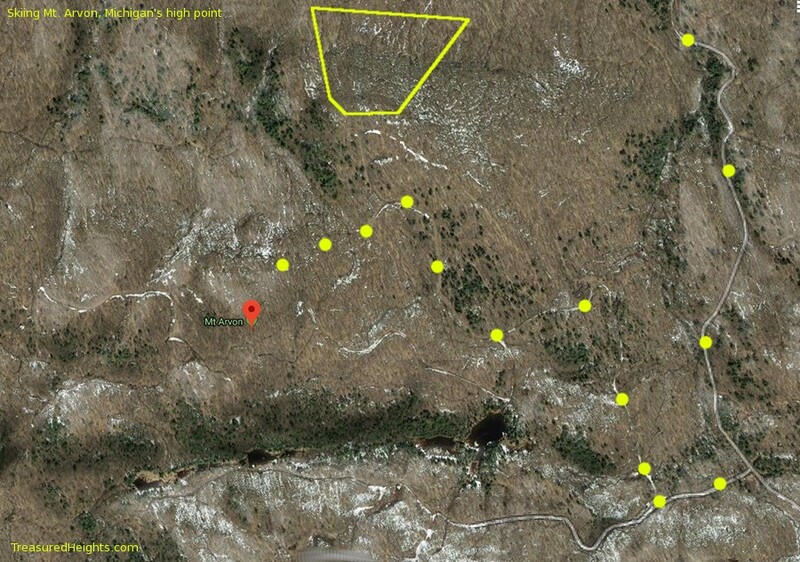 The yellow zone marked is likely the best skiing on the mountain. Probably good for laps just like Timms Hill. Conservation threats: Since the land is private there is a possibility in the distant future of the company selling off assets to private developers after it is fully logged. there are no urgent threats. Original owners: Lake Superior band of the Chippewa Indians. Currently the Keweenaw Bay Indian Community is active in the area, although doesn’t manage this land. There are no active avalanche resources in Michigan, however there are chutes, road cuts and other small open slopes which could slide. Areas like the Sleeping Bear Dunes certainly pose avalanche danger, like with anywhere else it is the skier’s responsibility to be aware and make decisions. Mt. Arvon is fully wooded and has basically zero avy danger. 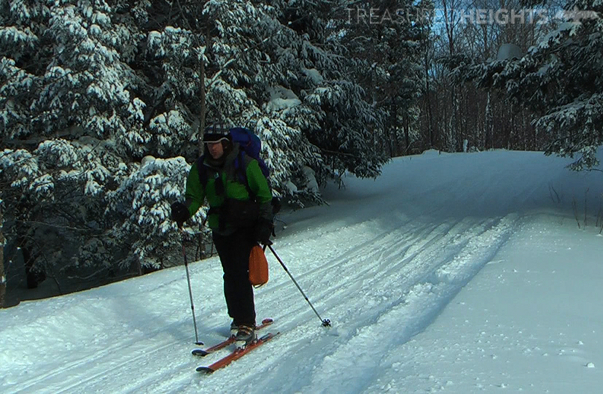 See my main Michigan backcountry skiing page here. 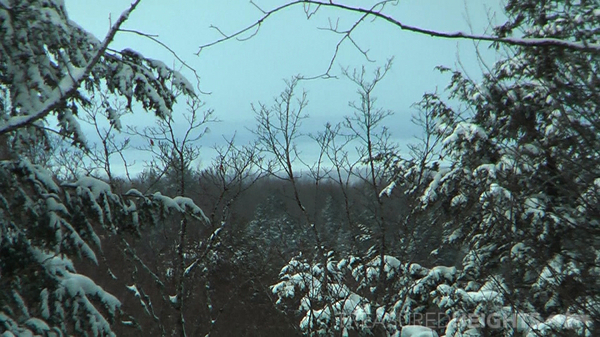 The only view of the lake I got that day, this is because Arvon is located in the heart of a wild chunk of woods. The Michigan episode of Skiing States is still in production. 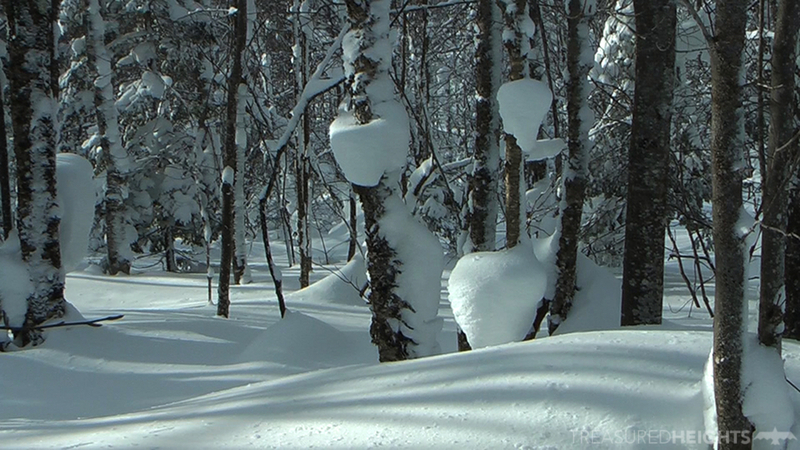 The Skiing States Minnesota film was released in fall of 2018 and shows skiing Eagle Mountain, the state’s high point. Subscribe to the Youtube channel or Facebook to keep in touch or make comments about this article.